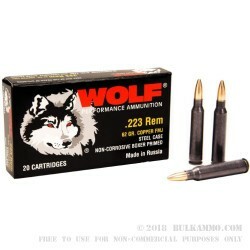 For the price this may be among the best ammunition for the .223 in a larger grain weight (62 grains) for general range and target use and plinking. The sub 2 MOA accuracy is excellent for most open sight work and passable for many optics centric shooting activities. The Boxer primed steel cartridge cases offer solid functionality from feeding to extraction but are generally not reloadable due to the difficulty of the process and the low value in multiple reloadings. The performance of this cartridge is far beyond the cost of the rounds to shoot. This 62 grain projectile is best suited in shorter twist rates like 1 in 7 inches and 1 and 8 inches. The slower twist rates can easily accommodate the larger grain weight but the accuracy will suffer at longer distances (175 yards +) due to the bullet having less support in flight and dropping in trajectory or tumbling due to lack of rotational momentum/spin. 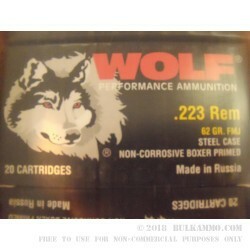 This is a very reliable cartridge and will function in any firearm that is chambered in .223 Remington. The potent powder charge and high end design for a steel cartridge offers a lot of power delivery for whatever the shooting task may be, up to and including target work, hunting and personal defense.